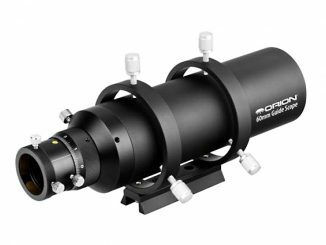 With its dewshield retracted and threaded 35mm tube extension removed, the 60mm aperture, 330mm focal length TSAPO60 refractor is just 23cm long. Its 2-inch push-fit drawtube rack-and-pinion focuser has a 2:15 reduction gearing for precise focusing. A 5cm-wide CNC tube clamp with a Vixen-style finder base has three threaded mounting points on each opposing face, so the supplied 10cm Vixen-style dovetail bar can be attached to either side. Sans star diagonal, the instrument as shown with a 2-inch to 1.25-inch eyepiece adapter tips the scales at a very modest 1.75 kg. As a frequent long-haul traveller between the UK and New Zealand, I consider that my reward for enduring at least 24 hours on a ‘plane is always the opportunity to explore the richness and variety of the Southern Hemisphere sky. But when total luggage allowances rarely exceed 23 kg, how does one choose a suitable telescope to take to far-flung dark skies? 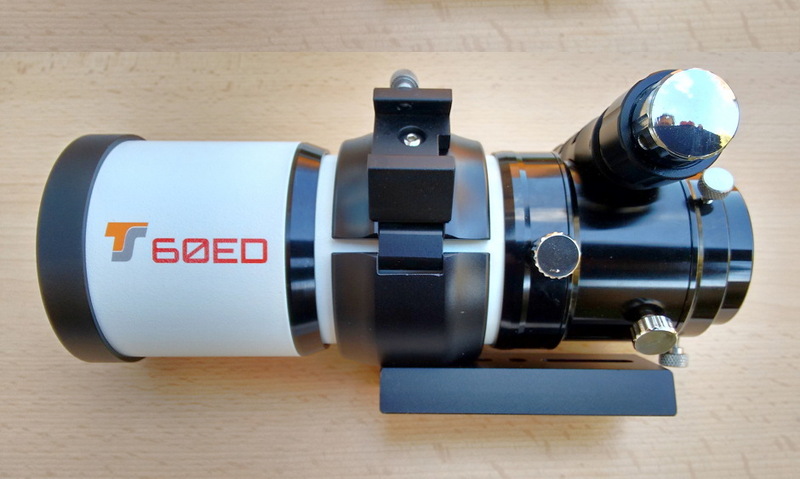 Fortunately for globe-trotters concerned about optical size and weight, Telescope Service in Germany has made that decision a whole lot easier with the introduction of the TSAPO60 — a compact and very versatile photo-visual 60mm f/5.5 (330mm focal length) ED refractor. 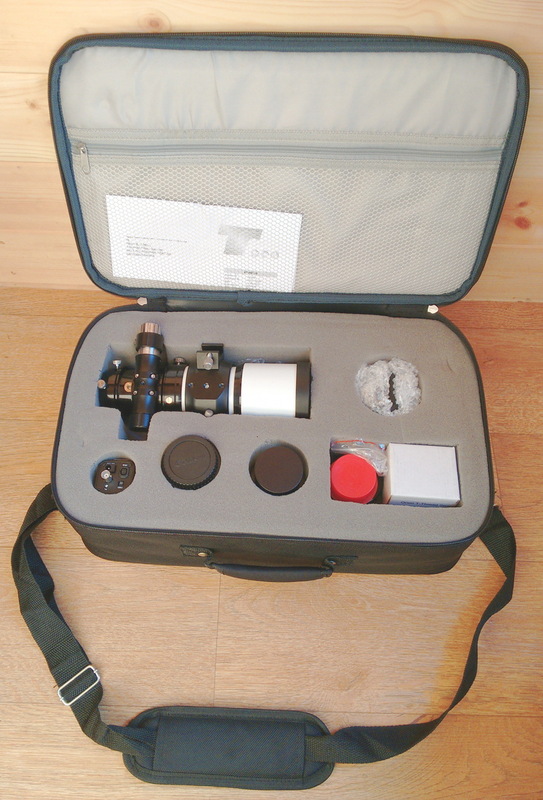 As befits a grab-and-go instrument, the TS Photoline 60mm f/5.5 FPL53 apo (to give it its full name) is supplied in a padded soft case measuring 47cm × 29cm × 15cm that contains ample foam cut-outs for additional accessories like star diagonals, field flatteners and eyepieces. However, one could use a much smaller bag (such as a large DSLR camera case) for a minimalist TSAPO60 setup. As befits a grab-and-go instrument, the TS Photoline 60mm f/5.5 FPL53 apo (to give it its full name) is supplied in a padded soft case measuring 47cm x 29cm x 15cm that contains ample foam cut-outs for additional accessories like star diagonals, field flatteners and eyepieces. However, one could use a much smaller bag (such as a large DSLR camera case) for a minimalist TSAPO60 setup. Being so short, the TSAPO60 eschews conventional tube rings in favour of a 5cm-wide CNC tube collar with a Vixen-style finder base. The tube collar has two opposing faces machined flat with three threaded mounting points on each face, so the supplied 10cm Vixen-style dovetail bar can be attached to either side. Sans star diagonal, the instrument with tube ring, finder base, dovetail and a 2-inch to 1.25-inch adapter tips the scales at a very modest 1.75 kg. Telescope Service has garnered a well-deserved reputation for the build quality and optical performance of its ED doublet and triplet refractors, and the TSAPO60 is no exception. The machining and anodising is first rate, quality fittings are used throughout and the whole instrument exudes an air of refinement. It looks and feels like robust travel-mate — first impressions subsequently confirmed during my recent round-the-world trip. The superb brass helically-cut rack-and-pinion focuser has zero backlash, and one full rotation of the 2:15 ratio fine focusing wheel advances the drawtube 2.2mm over a total travel of 60mm. The drawtube has an engraved millimetre scale which is extremely useful for reproducing approximate visual and photographic foci. The entire focuser can be rotated through 360 degrees as an aid to finding a comfortable eyepiece position or camera orientation during photographic compositions. The drawtube may also be locked down once precise focus is found. Two-inch push-fit diagonals, eyepiece extension tubes or focal reducers are secured by a non-marring brass compression ring via three clamping bolts at 120-degree intervals, reducing the likelihood of any optical tilt. One feature that contributes to both the compactness of the TSAPO60 and its versatility with optical accessories is the easily removable 35mm threaded tube section. While you may use a 1.25-inch (31.7mm) star diagonal with the tube extension in place, once it is removed and the rack-and-pinion screwed back on, suddenly you have ample back focus for a 2-inch push-fit star diagonal for a truly immersive wide-field visual experience, or enough in focus for the two focal reducer/corrector options offered by TS. More on those in a moment. Owing to its light weight and compactness, the TSAPO60 is perfectly matched to portable tracking mounts such as the iOptron SkyGuider or the Sky-Watcher Star Adventurer shown here. In under a minute, you can switch the TSAPO60 from visual to photographic mode. This looping animation shows the ‘scope with a 2-inch diagonal and zoom eyepiece for visual use, or an astromodified Canon 1100D and TSRed79 focal reducer/corrector for fast imaging at f/4.3. The TSAPO60’s air-spaced 60mm f/5.5 doublet objective is multi-coated on all air-to-glass surfaces. On the review instrument these gave the lens a blemish-free deep green hue. One element of the lens is made from extra-low dispersion and highly desirable FLP-53 glass. Consequently, as one would expect, the instrument’s colour correction is very good — particularly for such a relatively fast doublet. The TSAPO60 makes a wonderful daytime spotter ‘scope for wildlife or sporting events, particularly with an Amici prism star diagonal to deliver a fully erect image with a zoom eyepiece. On the night sky, one may use a Barlowed short focal length eyepiece designed to work with fast instruments at magnifications up to around 120x for Jupiter, Mars or Saturn, while the Moon and double stars will take somewhat higher powers in good seeing. My 3.2mm TMB Planetary eyepiece, which provided a magnification slightly in excess of 100x with a half-degree field, worked very well as a medium-to-high power ocular for truly memorable sweeps of the southern Milky Way for coloured double stars and bright clusters. The TSAPO60 delivers excellent colour correction and a tight Airy disc visually, provided one remembers this is just a 60mm refractor and generally stick to the ’twice the aperture in millimetres’ maximum magnification rule. At the lower magnification range, my 32mm Erfle eyepiece in conjunction with a 2-inch push-fit dielectric star diagonal delivered slightly more than 10x magnification, a 5.8mm exit pupil and a jaw-dropping 6.75 degree field of view — all with in focus to spare. The ’scope makes an awesome monocular — if you don’t mind the left-right mirror image with a conventional star diagonal. Telescope Service offers two photographic accessories: the TSAPO60-F field flattener (left) for full-frame DSLR cameras and the TSRed279 combination reducer/corrector for cropped APS-C sensors. The former threads into the focuser once the 2-inch push-fit adaptor is unscrewed, yielding a 40mm-wide corrected and illuminated field at f/5.5. 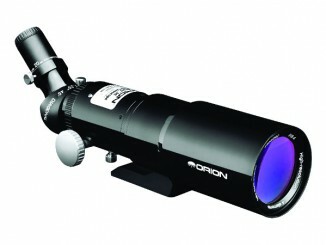 The latter turns the TSAPO60 into a fast f/4.3 instrument with a 30mm-wide illuminated field. Inevitably with such a fast 60mm f/5.5 doublet, there is field curvature. While you may only notice this visually with low power, wide angle eyepieces, when used photographically with a DSLR it is painfully obvious, manifesting itself in stars that appear as streaks in the corner of the frame while the centre of the field is perfectly sharp. The TSAPO60 is no better or worse than other ED doublets in this regard. Wisely, then, Telescope Service offers two solutions: the TSAPO60-F field flattener for full-frame DSLR cameras and the TSRed279 combination reducer/corrector for cropped APS-C sensors. The TSAPO60-F uses the popular multi-coated TSFlat2 corrector with a series of M48 extension rings to set the correct spacings for this particular instrument. Rather neatly, the 2-inch push-fit adaptor of the TSAPO60’s focuser unscrews revealing a M54x0.75 thread such that the 11cm-long TSAPO60-F unit merely screws in its place. All you need is an M48 bayonet adaptor appropriate for your DSLR camera body (55mm back focus) and voila — you have a flat-field refractor with a corrected illuminated field up to 40mm wide. Note that the TSFlat2 merely flattens the focal plane; the focal ratio remains at f/5.5 and the focal length stays at 330mm. While I liked the security and freedom from optical tilt that this threaded solution provides, the series of threaded M48 extension rings had brightly anodised internal surfaces and, in one component, the bright aluminium alloy was exposed; I would be concerned about internal reflections from bright off-axis sources as a result. However, it is a simple matter to flock the inside of the TSAPO60-F’s barrel or use a black permanent marker. Also, the fact that the focal ratio remains unaltered at f/5.5 might make the following more appealing. The TSRed279 is a four-element Riccardi-style reducer and corrector in a 2-inch push-fit body that offers a 0.79x reduction in focal ratio, turning the TSAPO60 into a speedy f/4.3, 260mm focal length telephoto lens. Also, at 235 Euros, it’s somewhat cheaper than the alternative. Ordinarily I would be a little concerned about the potential for such a device to tilt whilst in the focuser, but the TSRed279’s undercut barrel, the aforementioned focuser’s three clamping bolts and internal brass compression ring made for a rigid attachment that didn’t budge throughout weeks of testing. The TSRed279 is a four-element Riccardi-style reducer and corrector in a 2-inch push-fit body that offers a 0.79× reduction in focal ratio, turning the TSAPO60 into a speedy f/4.3, 260mm focal length telephoto lens. This equates to a true field of 3.3° × 4.9° with a cropped ASP-C DSLR. This is a single 40-second, ISO1600 exposure of the Eta Carinae Nebula region captured with an astromodified Canon 1100D, TSAPO60+TSRed279 using a Sky-Watcher Star Adventurer mount for tracking — no dark frame or flat fields applied. I really liked the TSAPO60+TSRed279 combo which, used in conjunction with an astromodified Canon 1100D, turned in an impressive performance. 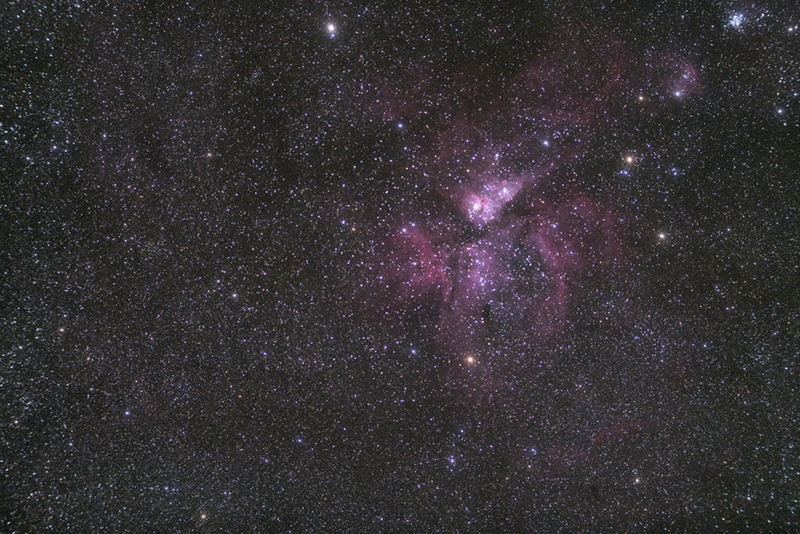 The accompanying image is a single 40-second, ISO1600 exposure of the Eta Carinae Nebula region using a Sky-Watcher Star Adventurer mount for tracking — no dark frame or flat fields applied. If, like me, you predominantly use cropped APS-C DSLR cameras, then the resultant 30mm diameter field illumination is perfectly adequate. As with any reducer/corrector, spacing is critical, but T2 (M42x0.75) spacer rings are easy to come by and TS provides distance data for common setups. 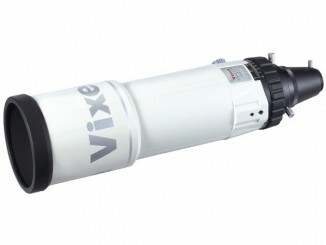 One may also use 2-inch light-pollution filters with the TSRed279. While the term astrograph is inappropriate for the TSAPO60+TSRed279, a well-corrected 60mm f/4.3 ED refractor that is 26cm long, has a mass of 2.1 kg and delivers virtually twice the photographic speed of a f/6 instrument is clearly worthy of consideration. Further enhancing its traveller credentials, a TSAPO60+TSRed279 and a DSLR (or TSAPO60 + star diagonal and eyepiece for visual use) is perfectly matched to portable tracking mounts such as the iOptron SkyGuider or the Sky-Watcher Star Adventurer. 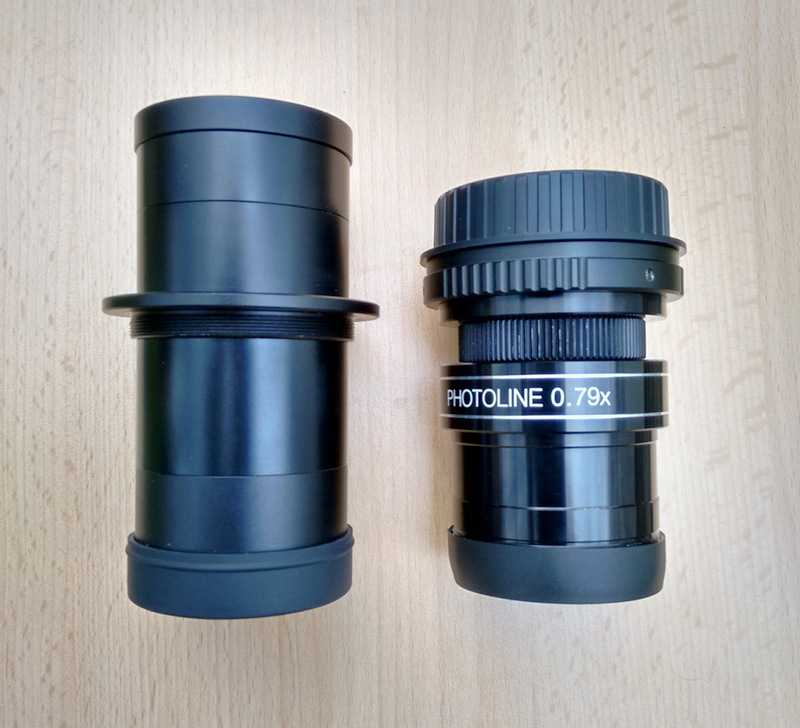 Investing in a Telescope Service Photoline 60mm f/5.5 FPL53 apo refractor and accessories provides you with a rugged and very versatile photo-visual companion that you will reach for every time your passport is required.